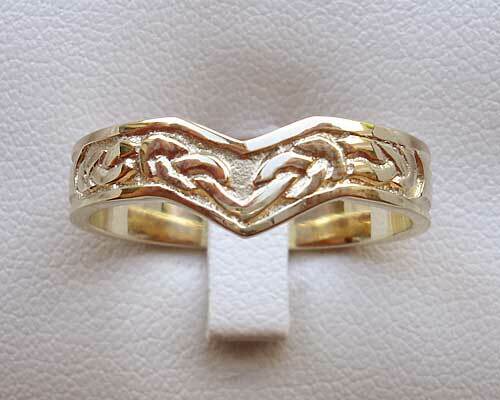 Scottish Celtic Wish Wedding Ring : LOVE2HAVE in the UK! 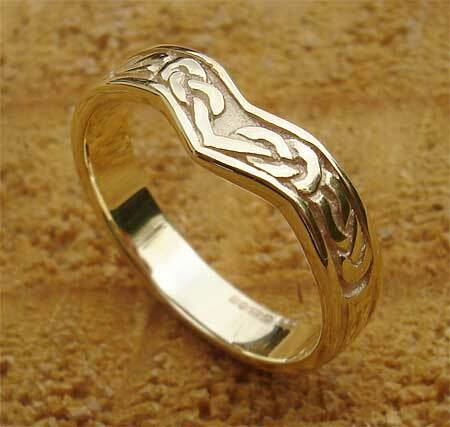 Your wedding wishes really can come true with Love2Have and featured here is a wishbone-shaped Scottish Celtic wedding ring made from 9ct gold with an approximate width of 5mm. It is designed to sit around the Celtic engagement rings we feature, but it also can be worn just like a wedding band on its own too. The ring features a simple but elegant Scottish Celtic knot pattern that does not go quite all the way around the ring even though our pictures give the appearance it may. The bottom of the ring is smooth. The wishbone design for this ring signifies balance in nature with the famous Yin and Yang symbols from other cultures.